Unforgettable Nevis Island Dining - Ambassadors of World Food Tourism. While islands have some similarities, all have different qualities. Some are great for suntanning or swimming. Others are fun for people-watching and reading. But when it comes to eating, the small Caribbean island of Nevis offers unforgettable island dining. Disclaimer: We were hosted by the Nevis Tourism Authority at various establishments on our visit to Nevis. We were not financially compensated. The opinions expressed are based on our own experience. Nevis is a small, luxurious island getaway in the Caribbean that is unlike many other upscale destinations. It provides a relaxed and beautiful environment where friendly inhabitants know one another and have found their own piece of paradise. They enjoy the bounty of nature, abundant sunshine, lush greenery, and fabulous, sandy beaches. 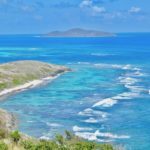 The island does not host huge cruise ship crowds and limits the number of visitors at a time, so you will not find yourself going toe to toe with tons of other tourists fighting for your space. For those of us who travel with our appetites in search of great food destinations, Nevis provides a wealth of island dining options. You can choose from casual open air lounging at the beach or a relaxed elegant meal in a romantic restaurant nestled among the trees. Here we touch on just a few of our favorites. 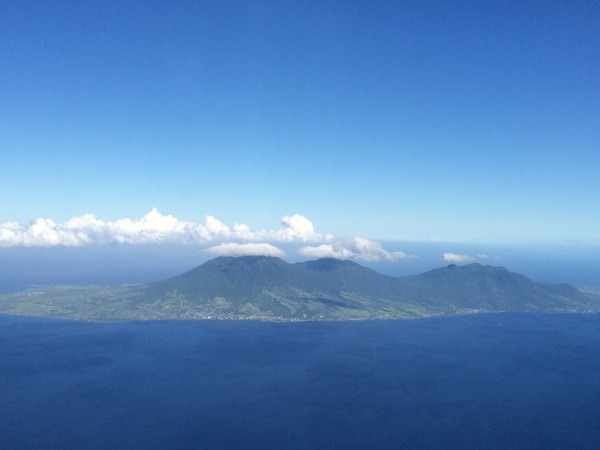 When you visit Nevis, you will undoubtedly discover some more of your own. Lime Beach Bar & Grill is located on Pinney’s Beach, one of the best known on Nevis. The casual ambiance set by owner Randy Jeffers immediately makes you feel at home. When complimentary pumpkin fritters with tangy mango salsa arrive, you know you’re in for a treat. 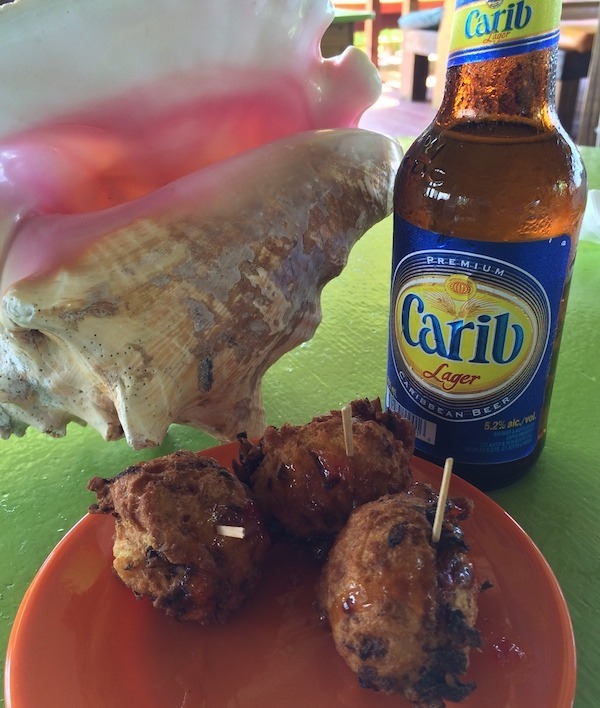 We paired it with a tasty Carib lager, brewed in nearby Trinidad Tobago and popular in the Caribbean. We learned that there are 4 local fish/seafood specialties: Mahi Mahi, Grouper, Wahoo and Caribbean Spiny Lobster. That’s pretty much enough to keep us busy for months! So we tried a bit of local fare. 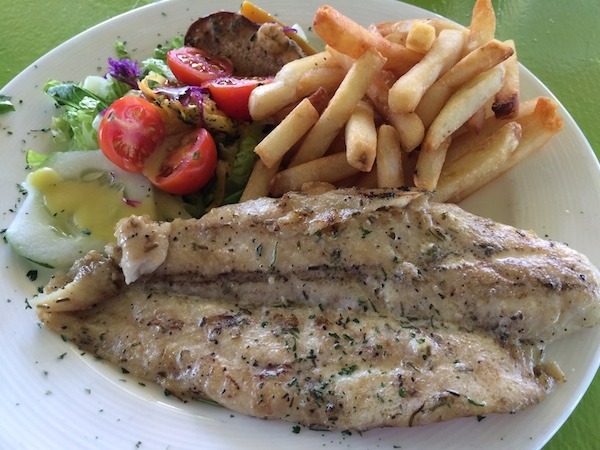 The grouper was delicious, prepared grilled with a light citrus sauce and served with a side salad and crispy fries. The grilled lobster was sweet and tender, served with a little melted butter, side salad and fries. Lime offers sandwiches, salads and desserts as well. Portions are plentiful and prices quite reasonable for great, fresh seafood. Right next door to Lime is Sunshine’s Beach Bar & Grill . Somewhat of a local celebrity, Sunshine is a native of neighboring St. Kitts. When we were there for lunch, the reggae music playing and the colorful college flags waving in the breeze lulled us into a state of relaxation that was undeniable. We had to try the “Killer Bee,” Sunshine’s own version of rum punch, which was a great way to start. Sunshine himself talking to the Food Travelists. We followed up with a hearty portion of grilled Mahi Mahi topped with a light citrus and fresh pepper salsa and served with a side salad and crinkle fries. 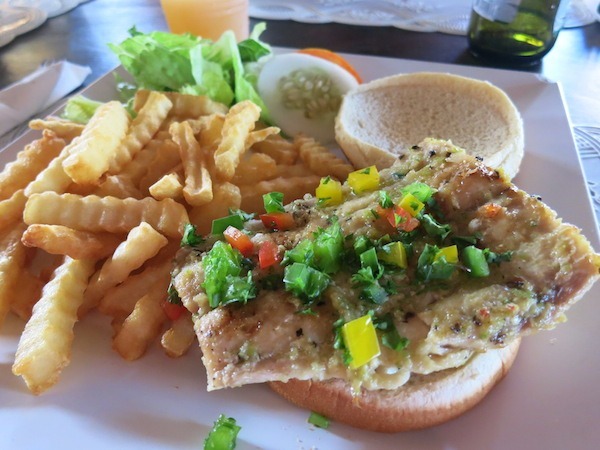 Mahi Mahi Sandwich At Sunshine’s Beach Bar & Grill in Nevis. We also tried the huge lobster salad, loaded with fresh vegetables and topped a light citrus dressing. Sunshine is also known for bbq chicken and baby back ribs. Other offerings include conch and grilled jumbo shrimp. Sunshine also hosts bonfires on the beach that are said to be a blast. Again, prices are reasonable for the quality of the food. 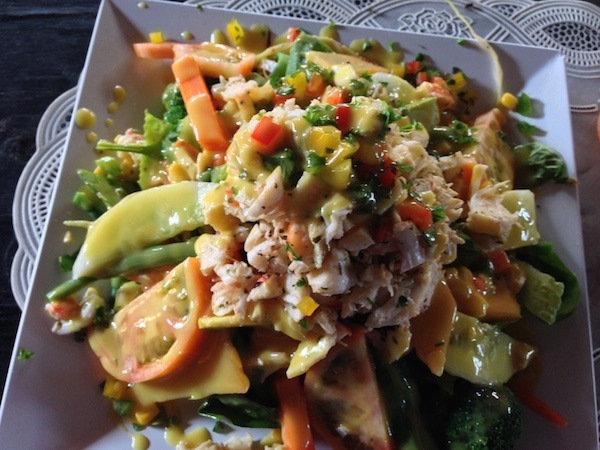 Lobster Salad at Sunshine’s Beach Bar & Grill in Nevis. Here’s one story that shows you the seductiveness of the Nevis lifestyle. Owner Hedda Wienpahl is originally Norwegian. She discovered Nevis and visited with her family year after year. After her 9th annual visit, they visited a real estate agent and thus began their permanent move to Nevis. Hedda from Chrishi Beach Club in Nevis. Most of the visitors to Nevis currently are from the U.S. and the U.K. Chrishi Beach Club, decked out like a lovely European café sitting smack dab on a gorgeous sandy Caribbean beach attracts a lot of both and so the modern menu reflects that fact. Surprisingly eclectic, including snacks, salads, pastas, sandwiches, soups and burgers, which are quite popular. Many gluten free and vegetarian options are available as well. We decided to test their “English Surprise” fish & chips and were thrilled to find the fish light and crispy and the fries crunchy on the outside and delicately soft on the inside. They both were delicious and served in just the right portion. 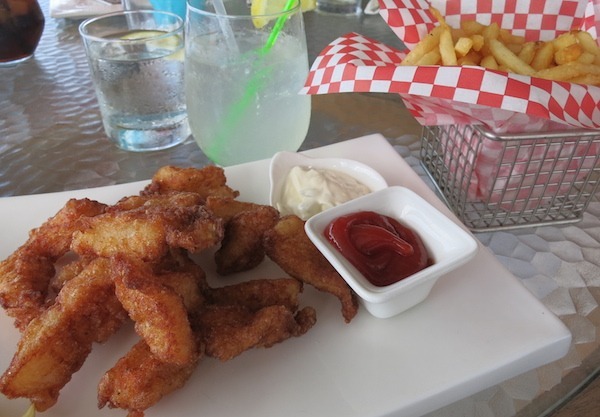 Fish And Chips at Chrishi Beach Club in Nevis. We also had to have a little more Grouper, so tried the “Grouper Scouper,” a lovely grouper filet with lettuce and tartar sauce on a soft fresh sesame bun. It too hit the spot. 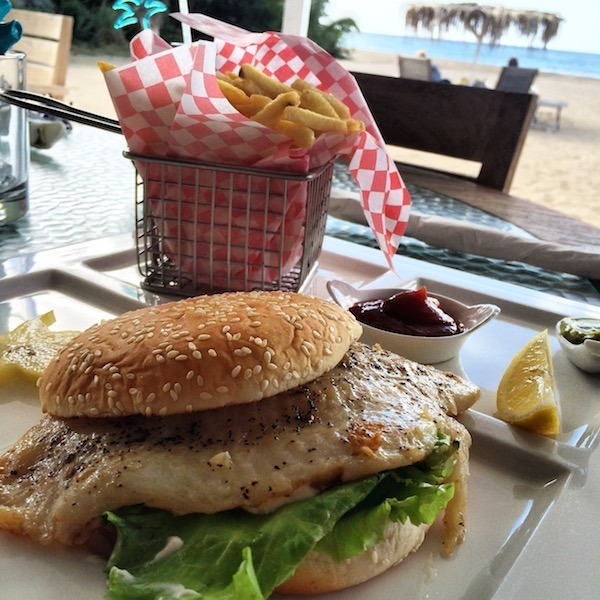 Grouper Sandwich at Chrishi Beach Club in Nevis. If you have any room after your meal, there are homemade brownies and carrot cake or ice cream for dessert. Regardless of what you choose to eat, the view of the beach is spectacular. No wonder the Wienpahls are developing this area of Cades Bay, with plans to build beachfront living right nearby. Of all the wonderful restaurants we visited, Bananas Bistro has by far and away the funniest story. British Chef/Owner Gillian Smith was a happy wanderer with dancing in her blood. She refers to herself as a former “can-can dancer,” and came to Nevis originally while planning to head to South Africa. She saw an opportunity in an old rum shop and turned it into a bistro, literally running the place by herself. The Nevisians loved her recipes, drawn from the pages of Gourmet and Bon Appetite and she decided to stay. She’s now built a permanent home for the restaurant and herself (and 9 dogs!) that exudes romance with a little bit of wackiness. As always in Nevis, a quiet elegance permeates the scene adding to the ambiance. 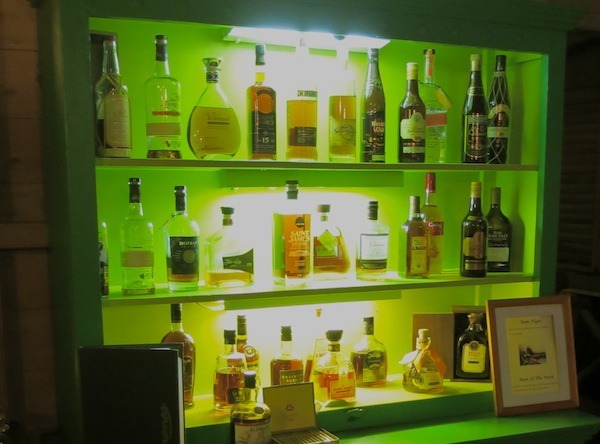 The rum selection at Banana’s Bistro is uncomparable! Things started off quickly with a creative cocktail menu. We tried the “Hot as Haiti” made with Haitian Barbancourt Rhum mottled with fresh citrus fruits and topped with Jamaican ginger beer and freshly grated ginger. We also had the Bertini, which is a passion fruit martini made with Absolut Kurant, passion fruit syrup and a squeeze of fresh lime. 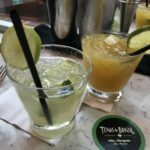 If you love rum be sure to check out their extensive rum selection even a Cuban rum is on the list. The rich and delicious food now served at Bananas Bistro is some of the best on the island. We tried several starters, including delectable lobster and sweet potato fritters served with a touch of tomato Sambal and cream conch gratin. 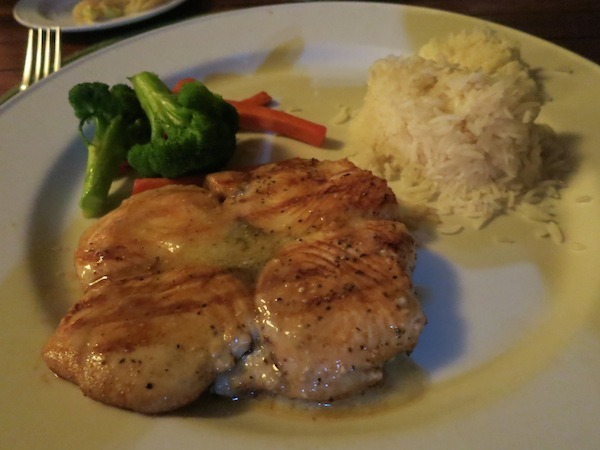 For our main courses we had to try to the fresh caught local Wahoo fish, nicely served with rice and veggies. We also couldn’t get enough lobster, so had to have the special lobster fettuccini alfredo, which was creamy, cheesy, lobstery perfection. 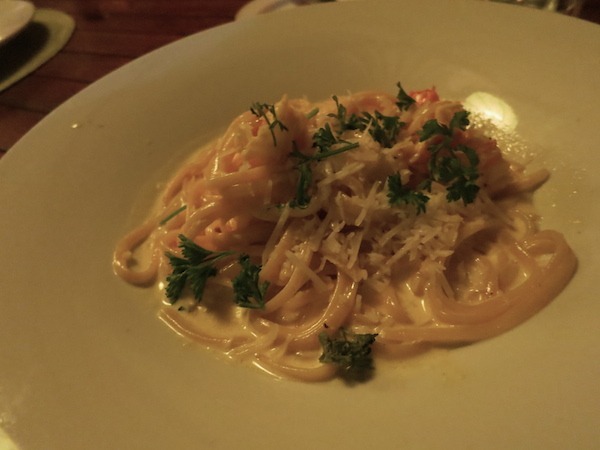 Lobster fettuccini alfredo at Banana’s in Nevis. There are lots of other options here from braised Morrocan lamb shanks and guava bbq pork ribs for carnivores to chickpea and vegetable thai curry and gnocchi in Portobello mushroom sauce for vegetarians. We tried the local crispy plantain chips with black bean dip and thoroughly enjoyed it. This is one place you simply cannot skip dessert. Several of Bananas’ desserts employ its namesake fruit, such as banana creme brûlée and warm banana bread with vanilla ice cream. Quite a delicious way to finish off the meal. 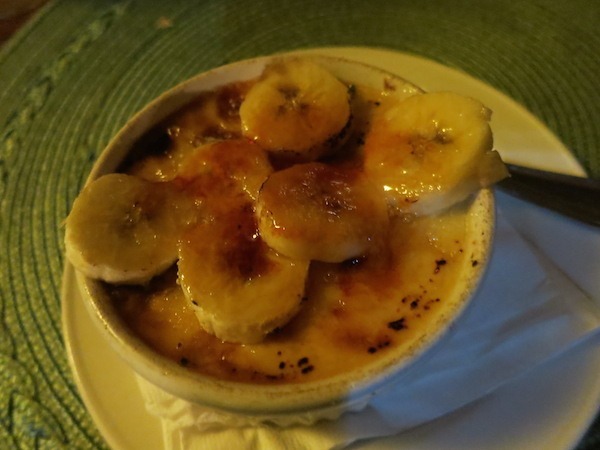 Bananas Creme Brulee at Banana’s on Nevis. 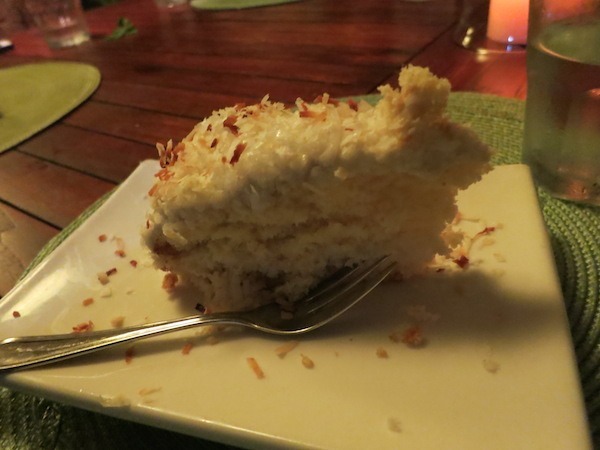 But when someone says they have a “famous” coconut cake, we have to judge for ourselves. And so we did. And it has well-deserved fame. Light and fluffy, sweet but not too sweet, this delightful dessert was worth every calorie. Delicious island dining awaits you on this most rare and enjoyable of low-key luxury destinations. Whether you love fresh seafood, local flavors or personalities plus, you will find all of these and much more in the island dining. Banana’s Chef Gillian sums it up nicely when she says “I really believe that there is a difference between service and hospitality. 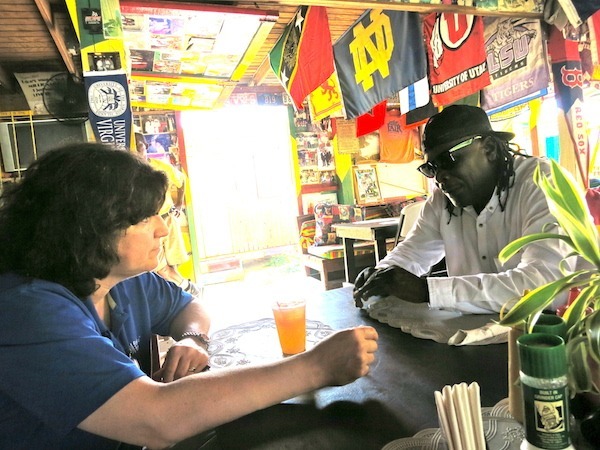 At Bananas we want you to feel that our welcome is genuine and we are truly happy to be here to serve you…” This can be felt everywhere on the island, making for unforgettable Nevis island dining experiences. 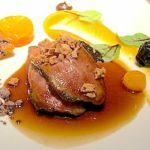 For more on Nevis and our stay at the Hermitage Plantation check out Nevis and the Hermitage Feasting in Paradise. 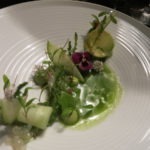 THE QUICK BITE: For those of us who travel with our appetites in search of great food destinations, beautiful Nevis in the Caribbean provides a wealth of island dining options to suit every taste. Mmmm, I’ll start with Lime’s pumpkin fritters, then the Sunshine lobster salad or maybe Chrishi’s grouper sandwich and for dessert Banana’s coconut cake. Dining in Nevis looks delicious! 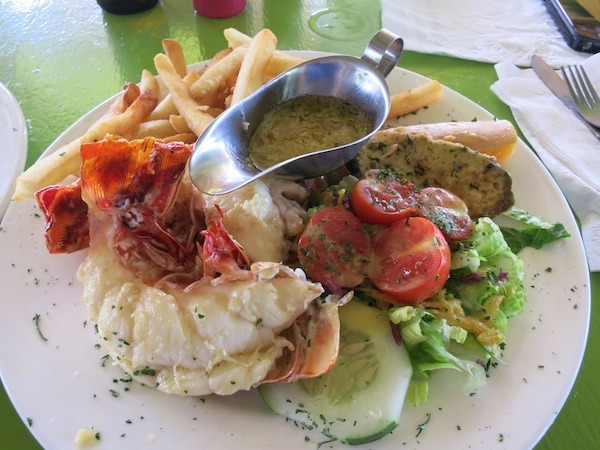 Well, you certainly ate well in Nevis! Myself, I’d be very happy with that lobster plate at the Lime Beach Bar & Grill. All that food looks scrumptious! Would love eating my way through Nevis! Reminds us of St. Croix. There’s nothing like an ice cold Carib by the Caribbean. That Caribbean Spiny Lobster looks delicious. I never imagined Nevis as a culinary destination but it surely is! Thanks Charles appreciate you stopping by. 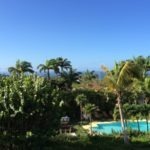 This post takes me back to my last visit to Nevis three years ago. (we visited several times in the late 1980s) It is a magical place. I ate at some of the restaurants you listed, but not all. I also discovered a few other favourites. When we visited in the late 80s, there weren’t as many places to stay. The primary accommodation was at the plantations turned into inns. You generally stayed on the Modified American Plan, which meant you ate (beautifully, leisurely, and deliciously I might add) breakfast and dinner at the inns. That meant there were fewer other restaurants – more lunch places than anything else. When we returned three years ago, we were delighted to find the wonderful variety of restaurants now available. You’ve gotta go back Donna it’s really a beautiful, relaxing and tasty island. This post took me back to my last visit to Nevis three years ago (we visited several times in the late 1980s). It is a special magical place. I ate at some of the restaurants you listed, but not all. I also discovered a few other favourites. When we visited in the late 80s, there weren’t as many places to stay. The primary accommodation was at the plantations turned into inns. You generally stayed on the Modified American Plan, which meant you ate (beautifully, leisurely, and deliciously I might add) breakfast and dinner at the inns. That meant there were fewer other restaurants – more lunch places than anything else. When we returned three years ago, we were delighted to find the wonderful variety of restaurants now available. Thanks for the inside scoop Ann Margaret. We did taste the wonderful run punch at the Hermitate and their delicious food it’s in another post which you can read here. Thanks for stopping by and we will definitely look you up next time we’re in Nevis.